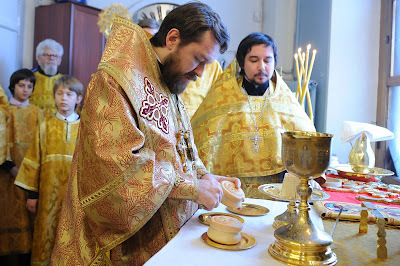 Metropolitan Hilarion of Volokolamsk, head of the Department for External Church Relations, celebrated on 30 January 2011 the Divine Liturgy at the Church of Our Lady the Sign to All the Afflicted-in-Bolshaya-Ordynka in Moscow. “Dear Brothers and Sisters, today we heard during the Gospel’s Reading the story of how the Lord Jesus Christ healed a blind man who was sitting at roadside, asking for salvation and healing. The Lord said to him, "Go, your faith has healed you" (Mk. 10:51-52). “These words of our Saviour point to the direct relationship between spiritual vision and faith, between spiritual blindness and lack of faith. Unbelief is spiritual blindness that obturates God and the reality of the spiritual world. A non-believer is incapable of seeing the spiritual reality behind the phenomena of the visible world, which is present and co-exists with the material world. Spiritual blindness is the inability of man to see the hand of God in his life. A spiritually blind one ascribes all the good things in one’s life to oneself and thinks that if one succeeded in anything it happened thanks to one’s own talents, abilities and resources or through a coincidence. And when a temptation or trial or sorrow or suffering comes, such a person loses heart and falls into despair because this experience does not fit in his idea of happiness, success and prosperous life. Such a person does not see the causes of either positive or negative developments taking place in his life. It seems to him that all this is a chance, a good or bad luck. “A spiritually blind man normally does not see his shortcomings. It seems to him that everything is all right in his life, that he always acts as appropriate, and if some problems arise in his relations with others, these others themselves are to blame because they underestimated, misunderstood something or did something wrong. He is certain: ‘I did everything in the right way, but all those around me did it wrong’. “A spiritually sighted person, to whom the Lord has opened his eyes, sees the hand of God in everything, understanding that life is not a coincidence and that the Lord guides him like a mother fond of her children on the way to the Heavenly Kingdom. Such a person understands that if difficulties and problems arise in his relations with others, he has to ask himself: did I do it in the right way? Perhaps I have overlooked something or did or said something wrong? A spiritually sighted person is aware that the cause of many of his troubles and sufferings lies in himself. “But if he scores a success, he first of all thanks God because he knows: He is the One from Whom all good things come. And even if a person himself achieves much through his own efforts, isn’t it the Lord Who has given him talents, health and strength to do it? “This is the difference between the spiritual blind and spiritually sighted. Such people live next to us, in the same world, and move in the same circle. They can sit in the same office, live in the same flat, but they look at things quite differently. One of them is sighted while the other is blind; one believes, while the other does not. One, seeing a miracle, says, ‘It is a miracle of God which has happened so that my faith may be stronger’, whereas the other, witnessing a miracle, is sure that ‘It is a coincidence, there is no miracle’. “The Lord has opened for us, believers, our spiritual eyes so that we may contemplate His beauty, be guided in our actions by His divine commandments and help those whose spiritual sight is still closed to see His presence in their life and to feel the hand of God in various life circumstances. We should in the first place show by our own example that God exists, that He is not somewhere far but here, among us, that God is not indifferent to our life but participates in it, helping us in every good task, preventing many troubles and sorrows and guiding us on the way to the Heavenly Kingdom. “May the Lord give us all to be spiritually sighted, not to fall into spiritual blindness and remember that if the Lord has opened our eyes we should be especially attentive to ourselves, to each other and to our neighbours. If there is a spiritual blind person next to us, we should remember that we cannot heal him as the Lord did – with a wave of His hand, but we should help such a person to gradually heal himself from spiritual blindness. May God give that as many as possible people around us may see the presence of God and turn from non-believers to believers, that the Lord may make the Church grow and bring more and more new people to the faith, that people may turn from spiritually blind into sighted. Amen”.